There's a couple more things happening to get the power down too. Still waiting on parts...ho hum. Machine shop is waiting on me. Block is mostly cleaned up. Im looking at some light corrosion that connects all of the water jackets. 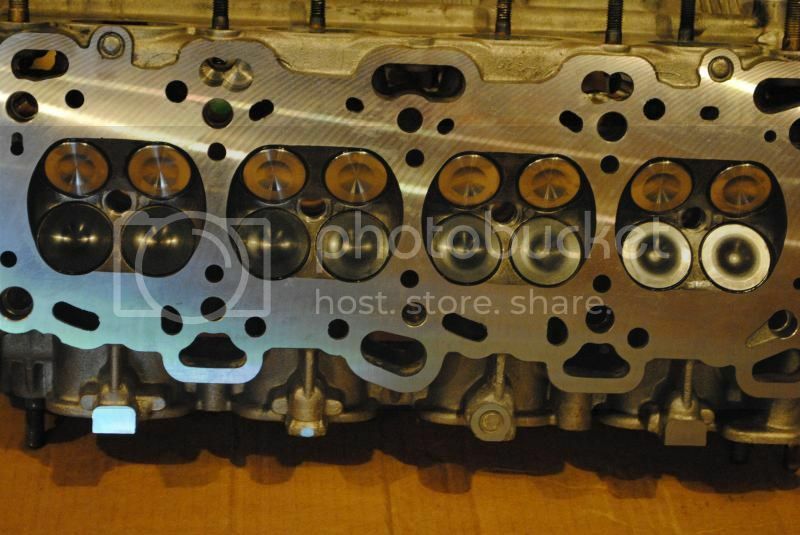 both head and block appear to be flat and not hollow in these areas, matching rust on block side of the head gasket. Just trying to decide the best course of action to get it cleaned up without screwing up the surface and without pulling the motor. Got the exhaust manifold ported and painted yesterday. little stiffer springs on order, but backordered until end of the month. Rear diff guy has given several of us a 2 week estimate on a "large run" of his 12 plate diff for the last several months. He's discontinued his 16 plate, which is the one I wanted to run. Im probably just going to send out the rear diff and tcase this winter for upgrades/rebuild. 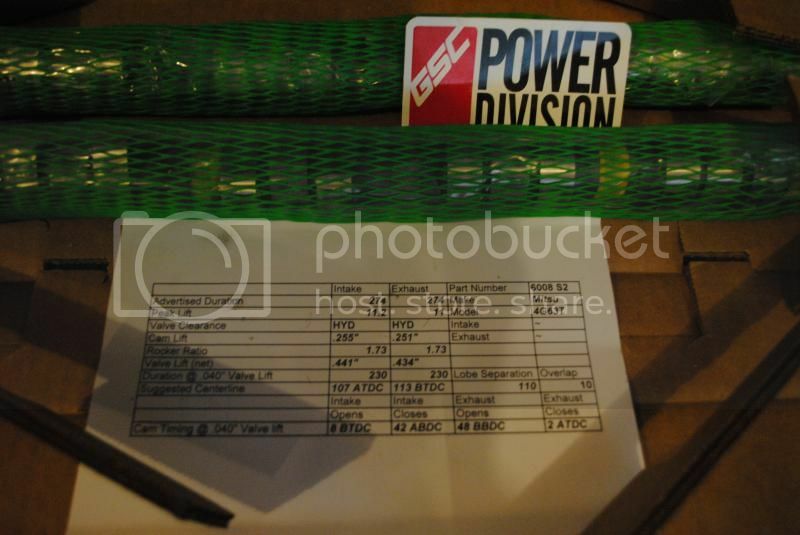 I don't think its going to be worth it to correct the factory diff stack without doing anything else to it and there aren't any other DIY plate/spring kits out there. Here is a very crappy video of my 1st idle attempt just after breaking in the cams. Yesterday morning I retorqued the head and got it ready for the street, the drive to work was the 1st road test session. Needed a TON of work, barely able to pass on the highway, rich and lean misfires everywhere. Definitely spent quite a bit of time chasing initial fuel settings in the dark but she's idling pretty good now and cruise is really close. Got it into some boost (18-20psi) this morning. Cant wait to turn the wick back up! Cant wait for this weekend. WHP and WTQ appear to be the same as before.....with 5-6 psi less, stupid rich and enough knock that its pulling timing. Cant wait to get it dialed in. She's going to wake up. 4psi less with a weak spool up duty cycle and NO losses down low. 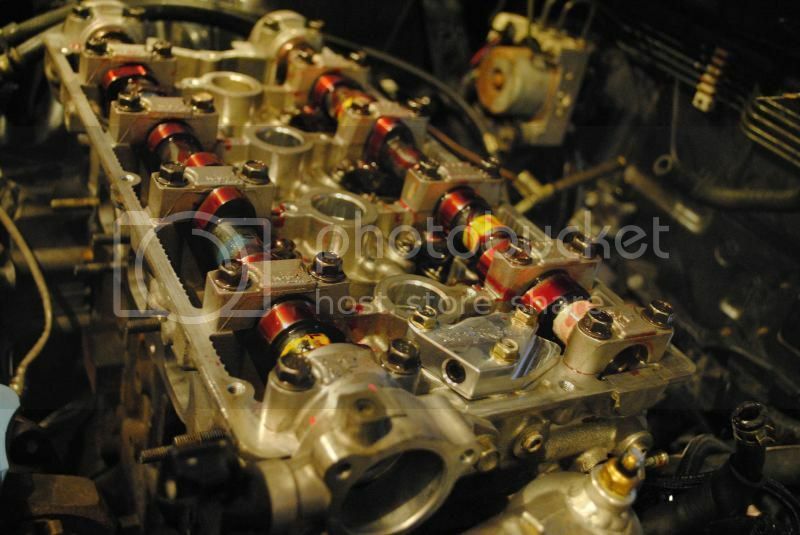 MR Chuck wrote: 4psi less with a weak spool up duty cycle and NO losses down low. Makes sense. Less restriction means less boost needed to get the same air into the engine. Here are a few pictures over the last couple weeks. Exhaust manifold porting. Right is almost done, Left untouched. Done with a Dremel. 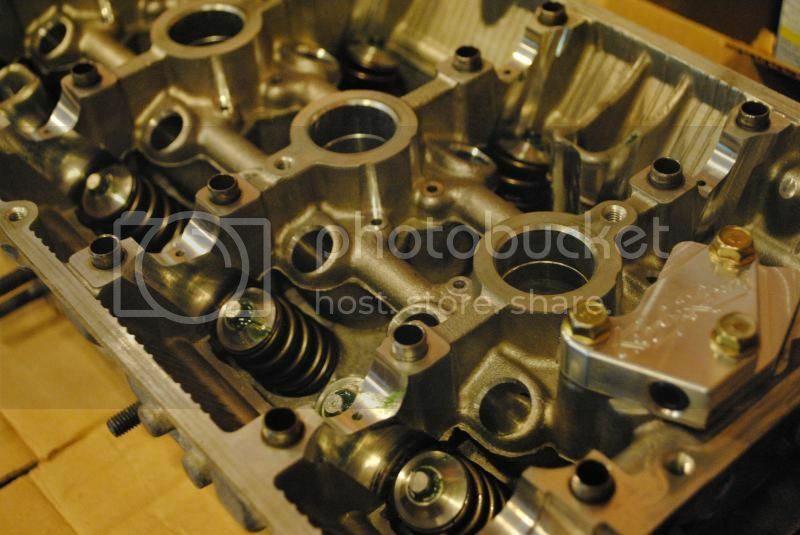 Fresh head back from the machine shop. Only had to skim it to take off gasket material. 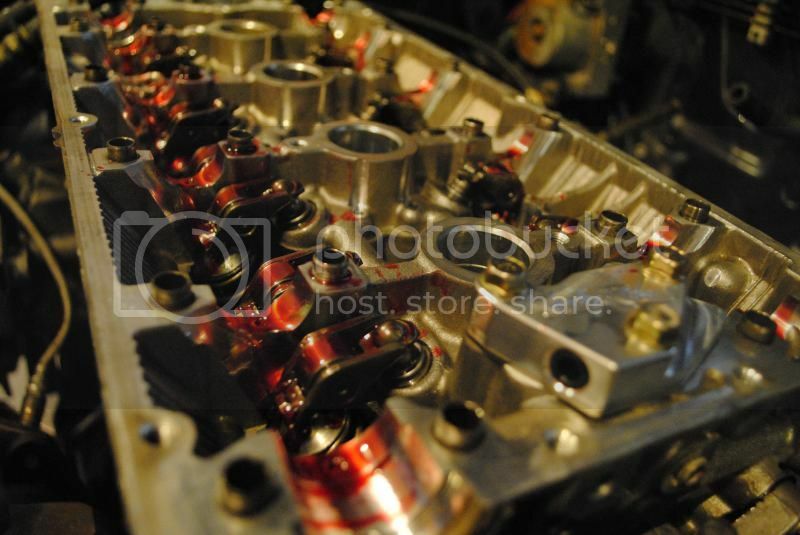 She got Supertech coated intake valves and Inconel exhaust valves, upgraded valve springs, Ti retainers, Kiggly HLA regulator, new oem keepers and valve seals. No more hot EGR gasses getting to this intake mani. Head installed a torqued. Lubing her up for some party time. My buddy Bob (he has an Evo X and the FD RX7 still for sale) actually helping out for a change instead of just flipping me crap all day! Almost done. Just monkeying around with the intake mani-alternator bracket that needs modified when putting a phenolic spacer on. At this point Im pacing back and forth nervous as all hell about startup. Took a 1/2 day off yesterday. Replaced my Diff Pump Reservoir lines with some that should handle ATF. I had originally used heater hose at the direction of the parts monkey. It seemed to be seeping through it... Got the line bled. Adjusted the e-brake. Been loose ever since the new rotors. Had a few incidents in grid with a runaway car...wont happen again. Secured front lip a bit better. Permanently set heater box to cold instead of full time hot. Broken cable...and as luck would have it, I sold my spare heater box and cables about 2 months ago. And of course lots more tuning. She's getting really close. Feels strong, just keeps pulling past redline. 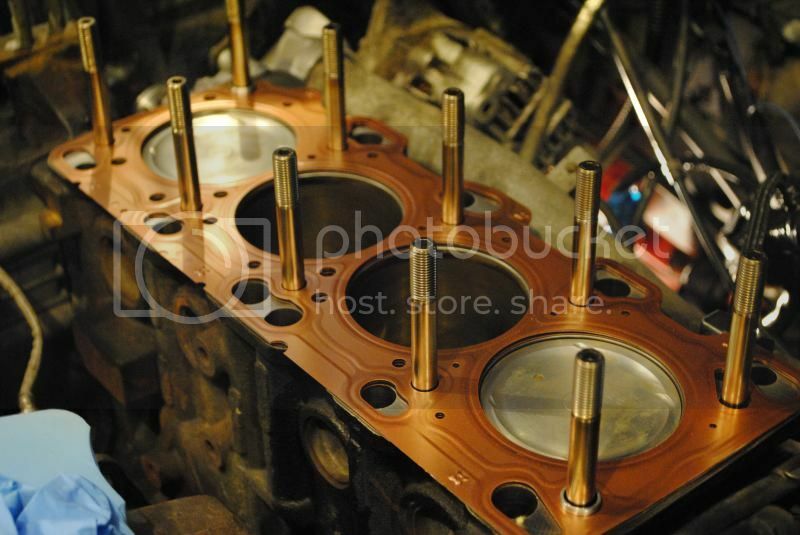 New valve springs will let me run a bit higher rev limit, may bump it just a bit. Currently at 7800. Looking like I may get the chance to take 1/2 day today too. More tuning planned. Might even give this thing its 1st bath of the year. Lots of mistakes both days. Couldnt get fast+clean all weekend. Had some issues getting lost at the same gate almost every run on Sun. Car is capable, Im overdriving it. Really happy with how it is running. Little more idle and cruise tuning to do. Its still full time open loop. I think Im pretty close on wot, just a few tweaks. Certainly pulls pretty good. No current power plots to compare to, but it seems mostly clean watching the knock light. Got an axle seal leaking. Replacement on the way, should have it done before the trip to Devens for the school. Got the axle seal replaced yesterday. So far so good. Drove it to work today...been out of town all weekend and I missed her. -Finally got my swift springs in. +2k all around. -Got some big boy wheels and tires. Definitely going to need some massaging to make them fit. I expect the school this weekend to kill the current tires. -Also got some caster/camber plates. Might need them for tire clearance at the front of the fender and I'll take all the caster I can get. Whats that Beatle's song?... "Leave It Be, Leave It Be"? Spacers wont be in until next week. So even if I tried, I cant have the wheels/tires on before the school this weekend. I am hoping to arrive at BNAS on them. 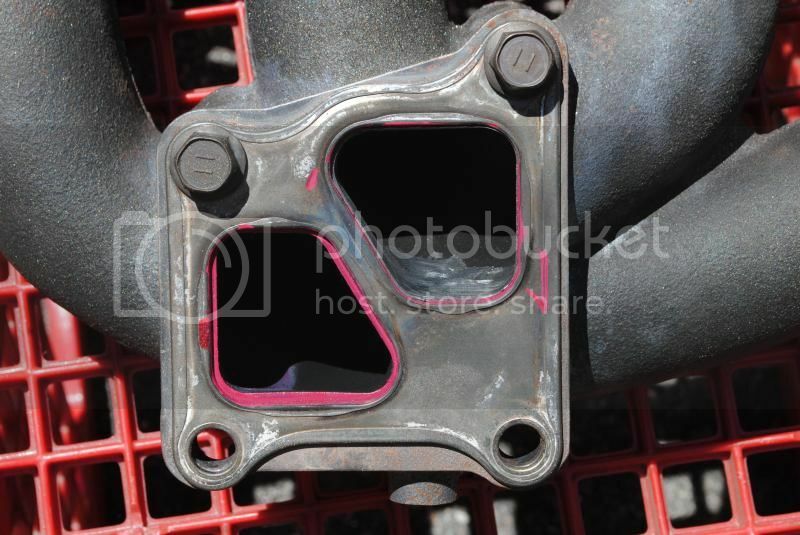 "Axle seal" leak returned at the school on Saturday. Closer inspection found trans oil ON TOP of the trans around shifter area. Kept an eye on it wiping down in between runs. 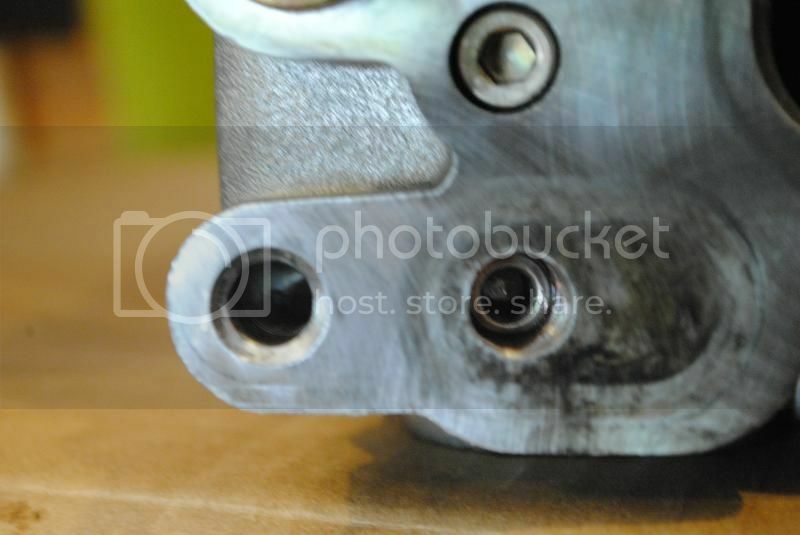 Later found pics online showing a breather plug next to the shifter that I do not have. Sunday covered it with tape with minimal loss. Confirmed my 6spd on the garage floor looks to have the right one. Doh! Planning a couple late nights this week to hopefully get some seat time on the goods before loring. Love the way it handles now. Ive never had so much fun autocrossing as I did last Sunday afternoon. Still easy to overdrive, but the limit has definitely shifted. The sway bar change is likely what caused it to be so loose all morning. Completely flopping my shock bias seemed to make it stable. External video appears that body roll is much less than before. It certainly feels like it transitions alot better and rotates MUCH better than ever before. Im looking forward to less garage time. Not looking forward to ending the season. You don't have to. You could attend 17 events at Devens after Loring in addition to the CMC BNAS date in September .